The Bolivarian Alliance for the Peoples of Our Americas (ALBA). Map by Evan Centanni. 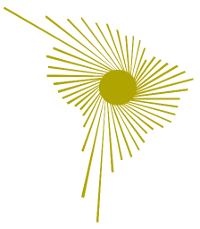 The Bolivarian Alliance for the Peoples of Our Americas (ALBA) is an intergovernmental organization open to countries located in the region of the Americas. "Bolivarian" refers to Simón Bolívar, a 19th century leader who founded several South American countries and wanted the whole continent to unite together as a single nation. ALBA was founded in 2004, as a response to the U.S.'s rejected proposal to create a Free Trade Area of the Americas (FTAA). The FTAA would have extended the North American Free Trade Agreement (NAFTA) - which has lowered trade barriers between the U.S., Canada, and Mexico - to all of South America, Central America, and the Caribbean except for Cuba. As a counter to the capitalist spirit of the FTAA proposal, Presidents Hugo Chávez of Venezuela and Fidel Castro of Cuba soon agreed to create ALBA, an organization for promoting greater integration among the socialist and social democratic countries of the region. ALBA plans to eventually introduce a new currency, the SUCRE, which will be shared by the member countries just like how the euro is the shared currency of much of the European Union. Virtual SUCRE currency is already in use for some electronic transfers of money between ALBA member countries. Although Cuba and Venezuela were originally the only two members of ALBA, the like-minded governments of Bolivia and Nicaragua joined in 2006 and 2007 respectively. Dominica became a member in 2008, followed by Antigua and Barbuda, Ecuador, and Saint Vincent and the Grenadines in 2009. Early last year, the organization admitted Suriname and Saint Lucia as "special guest members," indicating that they were in the process of achieving full membership. 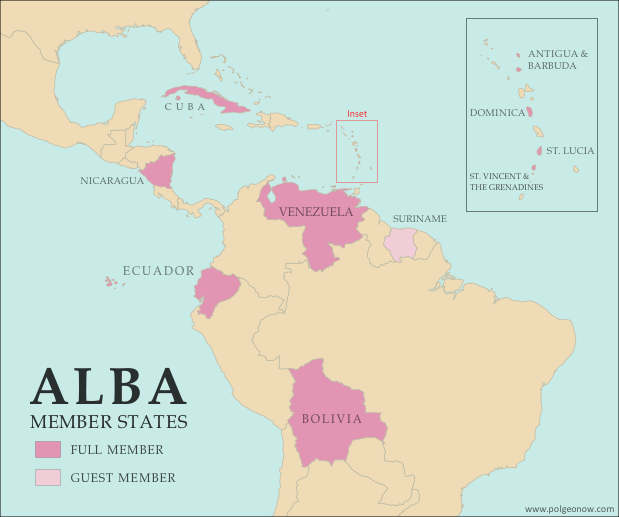 Membership in ALBA is not exclusive - many member countries are also part of other regional blocs such as UNASUR, Mercosur, or the Caribbean Community (CARICOM). While Suriname remains a special guest member, Saint Lucia was officially inducted as a full member at the end of this July. Saint Lucia is a small island country in the Caribbean, which was both a British and a French colony at times in the past. The Saint Lucian government's decision to join ALBA has garnered mixed responses from opposition parties, and becoming part of the anti-imperialist organization is seen by some as a break from the island's history of close ties with the U.K. There is also debate over the role of the new SUCRE currency in a country that already uses the shared East Caribbean dollar.